Nearly 8,500 physicians matched to fellowship positions through the NRMP’s Specialties Matching Service. The National Resident Matching Program® (NRMP®) is pleased to announce the release of “Results and Data Specialties Matching Service, 2017 Appointment Year,” an annual report of physician Fellowship Matches conducted by the NRMP Specialties Matching Service® (SMS®). 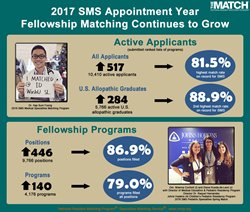 The 2017 appointment year was the largest in the history of the SMS, with 10,410 applicants vying for 9,766 fellowship positions offered by 4,176 programs across 62 specialties. The report includes data for the 26 Matches conducted in 2016 and early 2017 for fellowship appointments beginning July 2017, and provides five-year trend data by specialty, a state-by-state breakdown of participating programs, and match rates by applicant type. Of the 9,766 positions offered through the SMS, 8,483 (86.9%) were filled. Of the 4,176 participating programs, 3,299 (79.0%) filled all positions. Of the 62 participating subspecialties, 32 filled 90 percent or more of the positions offered and 21 filled less than 75 percent of the positions offered (see Table 1). Of the 10,410 applicants who submitted a rank order list of programs, 81.5 percent (8,483) obtained positions, the highest match rate on record for the SMS. U.S. allopathic medical school graduates matched at a rate of 88.9 percent, the second highest on record for the SMS. The number of registered U.S. osteopathic medical school graduates totaled 1,060, a 12 percent (110) increase over 2016 and a 67.2 percent (426) over 2013. The number of registered non-U.S. citizen graduates of international medical schools (IMGs) declined for the fifth year in a row, down 369 applicants since 2013. The Match uses a computerized mathematical algorithm to align the preferences of applicants with the preferences of program directors in order to fill training positions available at U.S. teaching hospitals. Research on the NRMP algorithm was a basis for awarding The Sveriges Riksbank Prize in Economic Sciences in Memory of Alfred Nobel in 2012. The National Resident Matching Program® (NRMP®) is a private, non-profit organization established in 1952 at the request of medical students to provide an orderly and fair mechanism for matching the preferences of applicants for U.S. residency positions with the preferences of residency program directors. In addition to the annual Main Residency Match® for more than 40,000 applicants, the NRMP conducts Fellowship Matches for more than 60 specialties through its Specialties Matching Service® (SMS®).